...I received a supersquishy from Kate N! 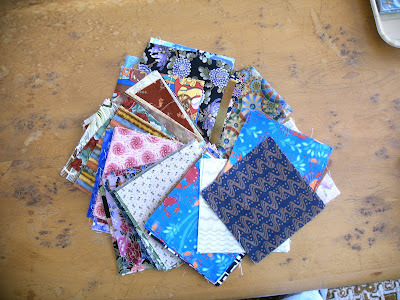 Lots of yummy 5" charm squares, including many oriental designs, and the larger strip of "oriental dartboards" that you can see at 2 o'clock in the picture. The picture doesn't really do them justice as the stack has to be 2" high, butI was too impatient to wait until I had fanned them out singly! I think there were 100 squares :) Now you will feel obligated to make something! Glad to hear you're on the side of those who try to learn the lingo. 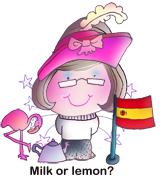 I don't live abroad but did study spanish at university for a couple of years. (Don't know any now of course! It fell out of my head somewhere) I have friends who live in france but they don't use a word of the language - and actually look down on the "locals" because they can't speak english. As someone who loves language for its own sake this really frustrates me as I would love to have their opportunities. Anyway - enjoy your craft fair. Como se dice "knitting" en espanol?